This is my Circles Series of paintings that I started up back in October 2012. I started doing these when a scripture would come up when we were praying for things going on. With almost all of these paintings, I would be doing something and just see the background in my mind and how it would almost look, etc. Then, later on, the Bible verses would come up during prayer time or sometimes just while I was doing other things. A couple of these I had been holding on to the backgrounds in my mind for a few months, until I knew which scripture to use on them. All pieces are available for purchase, unless otherwise noted. If you would like to purchase a painting, please contact me, and we can discuss delivery, options, etc. Want to see what I’m up to right now? Check me out on Facebook. Acrylic on 20in. x 24in. canvas. Painted in my home studio on September 30, 2012. More info here. Acrylic on 18in. x 24in. canvas. Painted in my home studio on May 5, 2013. More info here. Acrylic on 18in. x 24in. canvas. Painted in my home studio on June 1, 2013. More info here. Acrylic on 18in. x 24in. canvas. Painted in my home studio on June 19, 2013. More info here. Acrylic on 18in. x 24in. canvas. Painted in my home studio on July 14, 2013. More info here. Acrylic on 18in. x 24in. canvas. Painted in my home studio on February 9, 2014. More info here. My wife, kids, and I, have been praying for finances and the ability to purchase a new, larger home that fits all of our needs and dreams for some time now. Earlier on, back in November of 2011, we started feeling God telling us to do things that were moving us in that direction. We actually made a list recently of all of those things, and started checking them off, one by one, as we did them. Our finances have never been better, and we’re working on that house part yet. In October and November of 2012, the Wednesday night classes at church were going through a lesson series about prayer circles, based on a book and video called “The Circle Maker” by Mark Batterson. The book basically talks about “drawing” prayer circles around your dreams and desires, praying fervently for them, and not backing down. 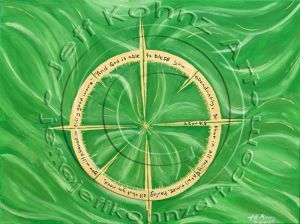 Going through this series, I started seeing images in my mind of painting backgrounds with prominent circle shapes, and then Bible verses in the shapes. That’s when it clicked for me. One thing that I’ve dreamed about for a long time was to able to make a viable living off of painting. 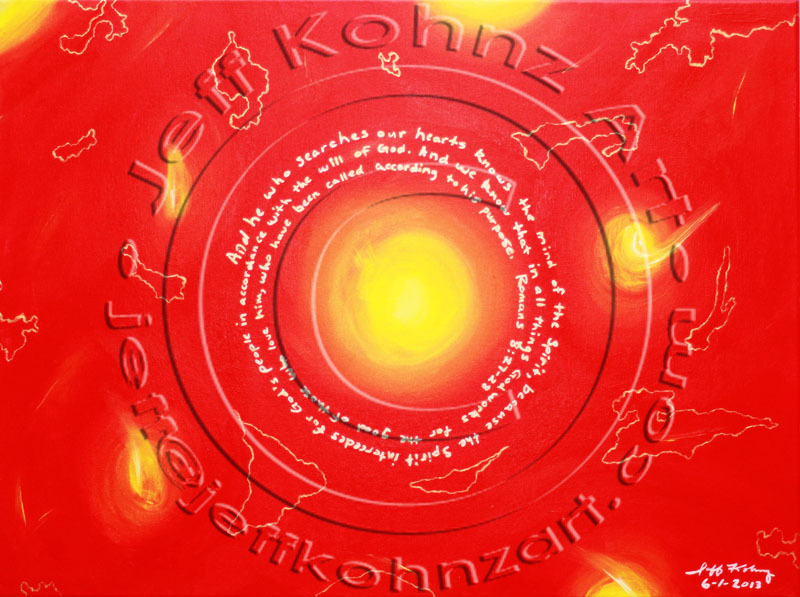 So, why not “draw” (or in this case, paint) prayer circles into the paintings themselves? If I truly want both of these dreams (house and career) to come into being, praying about them fervently, and even incorporating those prayers into them, seems like something I needed to do. This last one, number 6, I didn’t see until very recently. Just as I got the idea for “Dominion”, and told my wife about it, she brought up something that had not occurred to me before. See, I had figured out, after the 4th one, that I was seeing painting backgrounds that were sticking to a color wheel of primary (red, yellow, and blue) and secondary colors (purple, green, and orange). So, the final one would be orange. I hadn’t seen the background yet, but I knew it would be orange. Here is what we found on the colors. These are in the order they were painted. We found that the order of the colors, the names, and what they represent was very fitting to how the events in our lives have taken place recently. 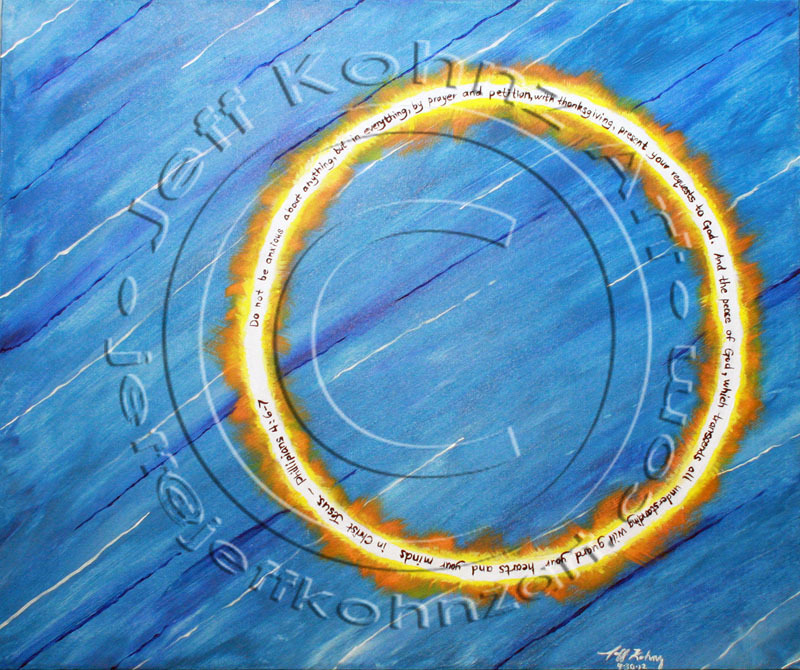 “Tranquility” – blue – color means peace, prayer, authority. 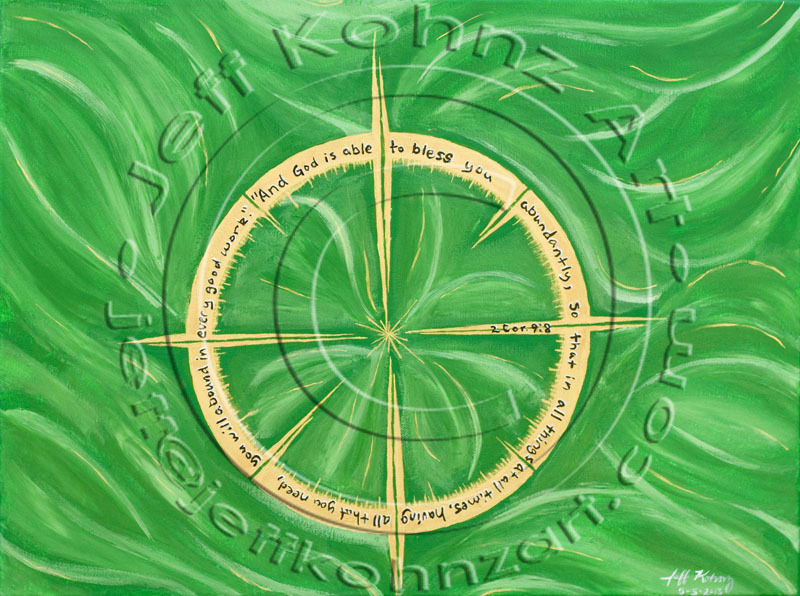 “Abundance” – green – color means blessings, abundance, sowing and reaping. 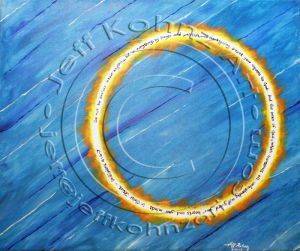 “Consumed” – red – color means covenant, blood, Holy Spirit, intercession. 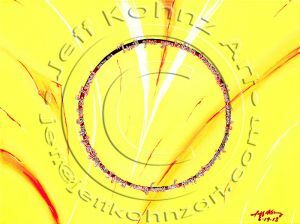 “Manifest” – gold/yellow – color means treasures of God, mercy, power, purification. 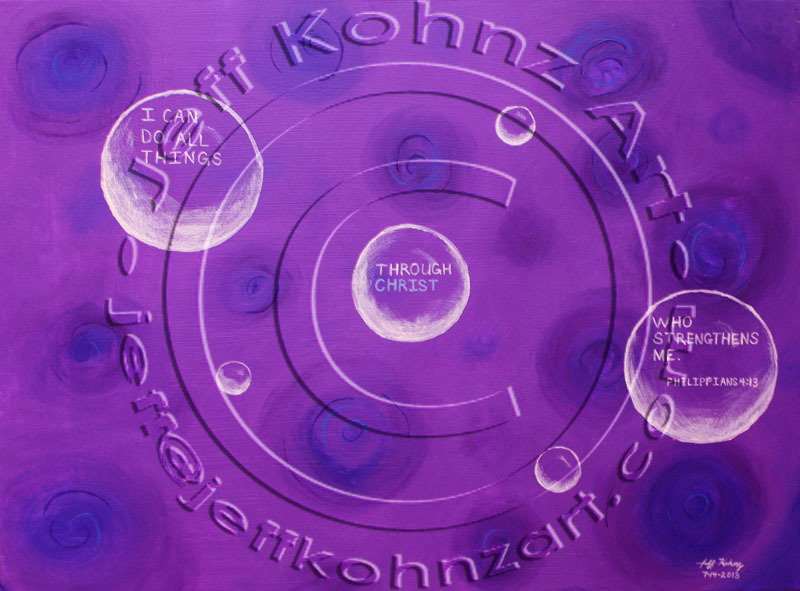 “Dominion” – purple – color means royalty, majesty, wealth. 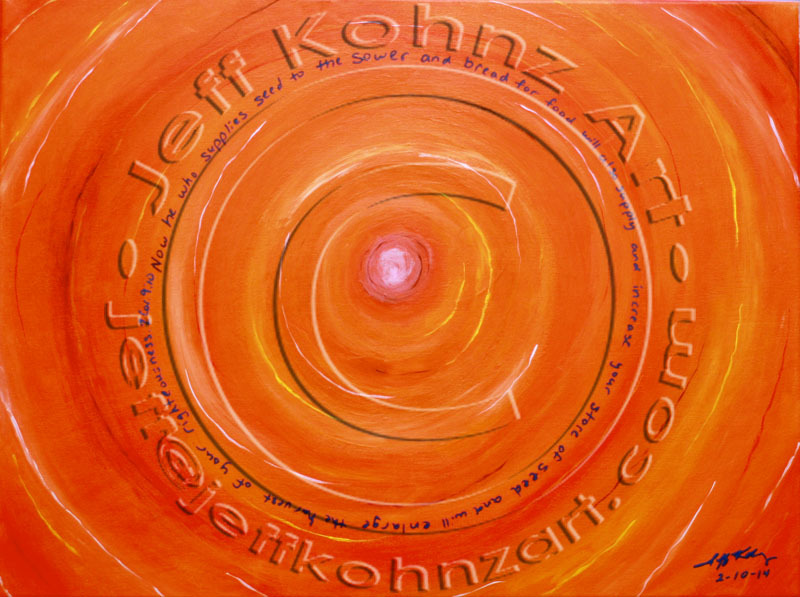 “Harvest” – orange – color means passion, power, fire, harvest season, fruitfulness. Due to a lot of life getting in the way, and some laziness on my part, it took me quite a while to start, and finish, this painting. I started this write-up back on August 18, 2013. In November of 2013, I started painting on it, and became very frustrated with how it was turning out. 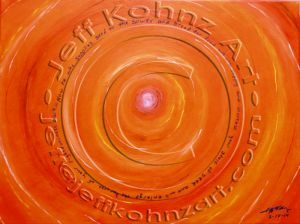 I was trying to do an orange water drop ripple that I had seen a picture of recently. I stopped, let it dry, and then threw 4 coats of white primer over it to start all over again. We, as Christians, need to stop trying to do things our own way. It leads to disappointment and, sometimes, disaster. I started working on this painting again on February 2, 2014. I almost had it finished, but had some struggles along the way with frustration. See, I currently paint in the kitchen, on a table that I also work from home on, as our house is small and packed to the gills. After flipping my paint pallet over and all over the table twice, I had had enough. I exclaimed that I was done painting until we moved, because I was done dealing with it. 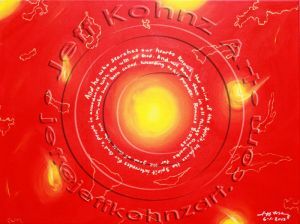 I finished the painting, except for the verse, and let it dry. I am much more satisfied with how it came out this time, especially because it is more of what God showed me, and not what I wanted to do on my own. After watching the Super Bowl, and calming down a bit, I realized that I was speaking something bad over myself. Forgive me Father! I decided to finally get off my rear and finish the painting on February 9, 2014. All that was missing was adding the scripture on there and letting it dry. Even that part ended up fitting perfectly, and took me only mere minutes to finish. Sometimes things just work out that way.